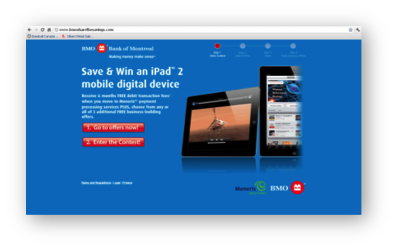 BMO Save & Win Campaign! Develop email leads for business banking products. The result was an influencer recommended micro-site with access to product coupons and a contest with extra entries for sharing. MavenSocial built a database of 15,000 potential prospects and measured the effectiveness of BMO’s social media marketing channels. Visits to campaign exceeded goals.